With few exceptions, most of the current publications on history of urology still ignore the scientific and technological events of the more than a thousand years between the Greco-Roman times and the modern era. This has broken an important link in the globally continuous line of progress and evolution of world civilizations. In this article, Professor Rabie E. Abdel-Halim restores this missing-link. He attracts the attention on the medical works of the scholars of the Islamic civilisation who lived and practiced between the 9th and the 13th centuries and whose Latinized books were available in Europe as early as the 12th century with their influence lasting until the 18th century: Ibn al-Nafis, Ibn Zuhr, Al-Razi, Ibn Al-Jazzar, Al-Zahrawi, Ibn Sina, Ibn Zuhr, Ibn Rushd, Muhadhdhab Al-Din Al-Baghdadi, Ibn Al-Baytar and Ibn El-Quff. This article was originally published as: Professor Rabie E. Abdel-Halim, "The Missing Link in the History of Urology: A Call for More Efforts to Bridge the Gap" in Urology Annals, January-June 2009, vol. 1, Issue 1-3, pp. 2-8. To visit the original article: click here (HTML version) and here (PDF version). Click here also to view the article on the website of the author. We are grateful to Professor Rabie E. Abdel-Halim for allowing republishing. Figure 1: A timeline graph showing the thousand years missing history. (Courtesy of The Foundation for Science, Technology, and Civilization). With few exceptions, most of the current publications on history of urology still ignore the scientific and technological events of the more than a thousand years between the Greco-Roman times and the modern era. This has broken an important link in the globally continuous line of progress and evolution of world civilizations. Another aggravation of that missing-link problem in the history of urology, and history of medicine in general, is the large number of articles based only on copying from secondary sources without checking the primary sources (the edited and published original manuscripts). Such articles easily propagate omissions, deficiencies, misunderstandings, distortions, and unfounded claims. On the other hand, in the Arabic and Islamic world, though many original authentic medical manuscripts written by famous scholars of the Islamic era were authoritatively edited and published during the 20th century, the number of primary source studies based on them by historians or medical researchers remained few and were limited to individual efforts. Therefore, we focused on this missing-link era and performed several primary source studies of the published medical works of ten scholars who lived and practiced between the 9th and the 13th centuries and whose Latinized books were available in Europe as early as the 12th century with their influence lasting until the 18th century. Our results confirm that those scholars of the Islamic era were not mere compilers or sheer transmitters of Greco-Roman medical literature. On the contrary, they critically reviewed the translated heritage of previous civilizations rejecting what is superfluous and accepting only what proves to be true. They added original contributions to the progress of urology and pioneered new fields of medical knowledge and practice such as medical ethics, medical education, medical certification, health education, preventive medicine, hospitals and hospital training, medical-practice quality control, clinical medicine, differential diagnosis, experimental medicine, experimental surgery, beginnings of specialization, pharmacology, use of anesthetics, and many other new discoveries in anatomy, physiology, pathology, therapeutics, surgical instruments, and surgical techniques. In agreement with many historians, in the history of science, as in that of any expression of human intelligence and emotion, the past is never past, but continues and is very active in every form and at every manifestation of the present. Therefore, as stated by George Sarton, "we shall not be able to understand our science of to-day, if we do not succeed in penetrating its genesis and its evolution." This statement of Sarton can be further extended to include the following, "and if we do not understand our science of today we will not be able to add to it." More than 1000 years ago, Abu Bakr Muhammad ibn Zakariyya Al-Razi, stressed on the same point saying that the scholar who attains complete knowledge of the achievement of those who came before him will be able to add original contributions to it  . Figure 2: A Latin edition of the Kulleyyat of Ibn Rushd and the Taysir of Ibn Zuhr; the first ever example of joint authorship of a medical textbook. Printed at Venice in 1542. (Courtesy of Biblioteca Historica de la Universidad Complutense de Madrid). Such knowledge of the history of medicine has to be complete and uninterrupted in order to enable a person to make new advances to his contemporary practice. The history of progress of man to his modern condition is a fascinating story. The interest, as described by John Glub , is lost, however, when the continuity is concealed by the omission of periods of several centuries and the presentation of bits and pieces of history, gathered from here and there, in accordance with our own emotional prejudices or our national vanity. The line of evolution of history of medicine is continuous and uninterrupted. It has gone through several phases accumulating contributions of different civilizations, and numerous nations extending across several phases of evolution. Indeed, the medicine of today is a joint global contribution of the whole world. However, even up till now such an attitude of the universality of science is rare among the scholars of the contemporary Western civilization. As Philip Rehbock put it, "the situation for truly global treatments of the history of science has been especially barren. Ever since Europeans began to write it in the late 18th century, the history of science has meant the history of Western science. Like the courses for which they have been intended, textbooks in the history of science have largely followed this orientation ." This is in marked contrast to the scholars of the Islamic era who respected the universality of knowledge, and paid tributes to all contributors regardless of their color, tongue, religion, or ethnic and national origin. Accordingly in their works, Ibn Al-Nadim  Ibn Juljul , Sa'id ibn Ahmad ibn Sa'id Al Andalusi , Ibn Abi Usaybia'a , and many other Islamic scholars, looked upon the history of the progress of medicine as a global contribution by all nations, a heritage of all mankind.In his book 'Uyun al-'Anba' fi tabaqat al-atibba' , Ibn Abi Usaybi'a reviewed the progress of medicine from its beginnings up to his life time, following a thorough, accurate, and unbiased system, covering in a chronological order all civilizations in all parts of the world over all phases of development of medicine. Where is the missing link? Figure 3: Another edition of the two-volumes-in-one book shown in Figure 2 printed at Venice in 1553. (Courtesy of Biblioteca Historica de la Universidad Complutense de Madrid). It is noticeable that, in any contemporary article on urology or any other surgical or medical specialty, the more than 1000 years between Greco-Roman times and the modern era, are commonly overlooked; giving the appearance that during this period nothing worthy of mention happened in medicine. And the same holds true with respect to mass media resources and curricula at schools and colleges. In Europe, this period is usually referred to as the Dark Ages, in which the great era of the Greco-Roman medicine came to an end and no progress in medical science was made until the Renaissance. The state of decline of medicine in Europe during that period is well documented in details by all Western historians. As stated by Cumston, "at the time when the Arabs appeared in the Orient, Greek sciences were in total decadence and the practice of magic reigned supreme ." However, in the East, according to Dickinson , Sarton , Cumston , and Margota , the firm establishment of the Muslim supremacy, coincided with the development of botany, pharmacy, and chemistry – branches of science that the Muslim world is given credit for having established. With the spread of Islamic civilization between the 9th and the 16th centuries, the study of medicine and other branches of science revived and acquired a scientific basis. Nevertheless, with few exceptions, most of the current studies on history of medicine still ignore the scientific and technological events of the period. This has broken an important link in the globally continuous line of progress and evolution of world civilizations. As stated by Al-Hassani , students, who are trained to think critically, suddenly face a sullen darkness of ten centuries, and then are told things appeared, as if by miracle, all at once in the Renaissance [Figure 1]. This defies logic. Things, as any scientist knows, do not appear by chance. Continuity is basic, especially in the birth and rise of sciences; it is almost so in every other field of study. In agreement with Al-Hassani , Ghazanfar , Dawson    Gilson  , Haskins  , Makdisi , Cumston  and Sarton , this period of ten centuries set aside as ‘vulgar and dark', and given scant notice in books, curricula, and at universities, is actually the period when the grounds of modern science were mapped out and amplified; the period when the multidimensional development of Arab-Islamic thought provided the stimulus for developing the human intellect further, and for bringing about the forces of rationalism and humanism that led to the 12th century Medieval Renaissance, the 15th century Italian Renaissance, and indeed, for sowing the seeds of European Reformation. The examples for this literature gap in history of urology during the Islamic era are too many to list. It is quite a common finding in the current references and textbooks. In the West it has inevitably been the tradition to highlight Eurocentric culture, based on endorsing and attributing all, exclusively and solely, to the Roman and Greek cultures. This is the case not only with the historiography of medicine and other applied sciences, but also with that of all other venues of human thinking. 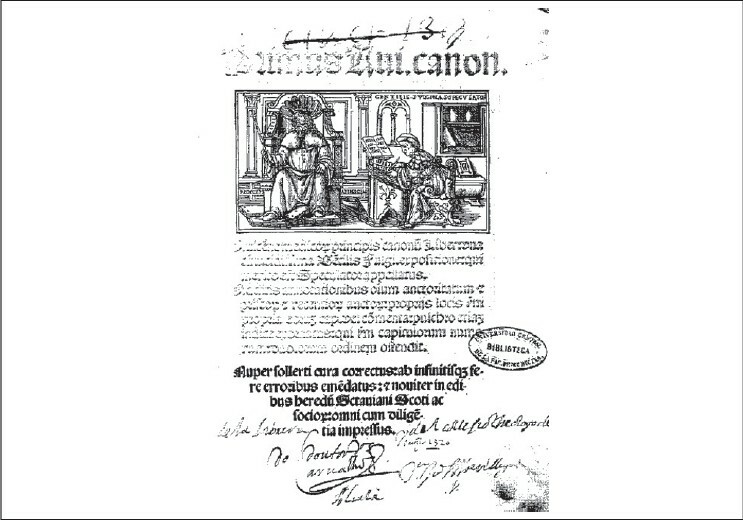 Figure 4: A Latin edition of Ibn Sina's Canon of Medicine printed at Venice in 1520. (Courtesy of Biblioteca Historica de la Universidad Complutense de Madrid). 1. While Haskins   and a few other science historians emphasize ‘continuity and change' as the hallmark of Middle Ages, one typically observes ‘discontinuity' and an almost exclusive ‘universalization' of European Dark Ages in literary history, pertaining to almost all branches of knowledge. Much of the literature reflects painstaking efforts to completely omit, negate, or minimize the significance of Islamic linkages; the Greek heritage is the primary emphasis. 2. The role played by the scholars of the Islamic era is only acknowledged as mere transmitters of the Greek heritage to Middle-Ages Europe, denying them any other achievements, additions, or original contributions. Although few Western historians in the first half of the 20th century, like Briffault , Ronan  and Sarton , did not approve such posturing, the current literature in history of medicine and history of science is still replete with such mistaken erroneous claims minimizing the role of the whole Islamic era to mere preservation of Greek science. 3. Another manifestation of the missing link is the toleration of the names of only few medieval Islamic scholars, as if they were exceptional individuals who sporadically existed and as if there were no others like them, in the whole Islamic era. This ignores the fact that a fully developed Islamic civilization involving all aspects of life existed in that era, and led to the flourishing of an original school of medicine which regulated medical education, medical ethics and certification, established hospitals as genuine medical facilities, and provided health services at primary care level in urban, rural, and military settings. There are documented biographies already available for hundreds of famous medical pioneers and professors, indicating that thousands of practitioners existed during that era. Even with the few names like Al-Razi (Rhazes) and Ibn Sina (Avicenna) commonly quoted in the Western references, because their original works are not checked or studied, nothing much is mentioned about their original contributions. 4. Another form of exclusion of the Islamic era from the history of progress of medicine is plagiarism, publishing the Latinized works of the Islamic scholars under the names of medieval European authors. The famous example for that is Constantinus Africanus, who as stated by Campbell , suppressed the names of the Arabic authors whose works he produced Latin versions of in the 12th century. Even more worse is the attribution of the commentaries of the Muslim scholars on the works of Galen, to Galen himself. The same happened with the Muslim's commentaries and additions to the important work of the 1st- century eminent herbalist Dioscorides. That is why Cumston  noted that many of the medicinal remedies reported by Dioscorides are of Islamic origin. 5. The missing-link phenomenon is also well represented by the many distortions and misunderstandings copied from one secondary source to another. The examples for those distortions, misunderstandings, and even accusations are too many to list. They are abundant both in reference books, scientific articles, newspapers, information media, and Internet. Most typical is the following quotation currently found on several online encyclopedias: "Independent investigation in the fields of exact science, anatomy, and physiology was forbidden by the laws of the Koran ." 1. First of all, very little or no studies are based on primary sources. Most of current resources are copied from previously published secondary source articles, without checking the edited and published original manuscripts. Such articles easily propagate omissions, deficiencies, misunderstandings, distortions, and unfounded claims. 2. Furthermore, almost all history of medicine research centers worldwide focus only on their local history and pay little attention, if any, to further studies in the medicine of the Islamic Era. 3. Moreover, with few exceptions, there is no academic interest in the history of medicine in the universities of the Arabic and Islamic world, and in contrast with the whole of the Western world, history of medicine is not yet included in their undergraduate or postgraduate curricula. 4. Similarly, although many original authentic medical manuscripts written by famous scholars of the Islamic era were authoritatively edited and published during the 20th century, the number of primary source studies based on them by historians or medical researchers remained very little. This is possibly because of the lack of academic departments or research centers devoted to history of medicine in those countries. Additionally, hundreds of medical manuscripts are waiting for editing and publishing. This represents a great obstacle as no one else cares for this neglected world treasure of knowledge. 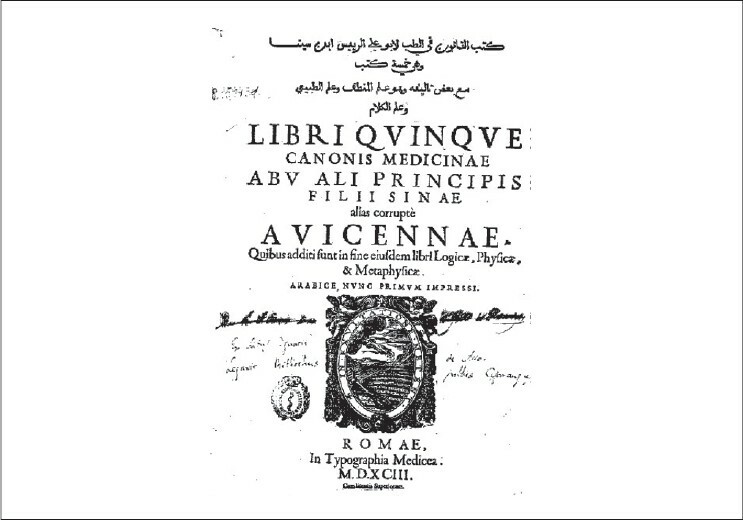 Figure 5: Another Latin edition of Ibn Sina's Canon of Medicine printed at Rome in 1593. (Courtesy of Biblioteca Historica de la Universidad Complutense de Madrid). Since the early seventies of the last century, we focused on this missing-link era and performed several primary source studies utilizing the already published original medical works of Al-Razi    , Ibn Al-Jazzar , Al-Zahrawi    , Ibn Sina , Ibn Zuhr , Ibn Rushd , Muhadhdhab Al-Din Al-Baghdadi , Ibn Al-Baytar , Ibn El-Quff  and Ibn Al-Nafis    , who lived and practiced between the 9th and the 13th centuries. Our study critically evaluated the contributions of this list of Islamic scholars to the progress of, not only urology but also clinical medicine, anatomy, physiology, preventive medicine, medicine, surgery, anesthesiology, antenatal care, pediatrics, social pediatrics, pharmacy, health education, medical services, hospitals, hospital training, medical education, and medical ethics. Their original works were compared with those of their predecessors and with those who came after them. Their influence on Medieval Europe and European Renaissance was traced, evaluated, and documented. Furthermore, original translations into English were made of relevant excerpts of all the works studied. The Latinized works of all those Islamic scholars [Figures 2–6] were available in Europe as early as the 12th century, with their influence lasting until the 18th century as documented by Sarton , Cumston , Cambell , Friend , Margotta , Radbill , Garrison , and by Ulman . Up till now, out of this ongoing long-term research project, several original contributions to the progress of urology by those scholars during the Medieval Islamic era have been documented         . This includes contributions to the progress of anatomy, physiology, pathology, clinical urology, therapeutics, operative urology, and instrumentation. Our results also confirm that those scholars of the Islamic era were not mere compilers or sheer transmitters of Greco-Roman medical literature. On the contrary, they critically reviewed the translated heritage of previous civilizations rejecting what is superfluous and accepting only what proves to be true. They added original contributions to the progress of urology and pioneered new fields of medical knowledge and practice such as medical ethics, medical education, medical certification, health education, preventive medicine, hospitals and hospital training, medical-practice quality control, clinical medicine, differential diagnosis, experimental medicine, experimental surgery, beginnings of specialization, pharmacology, and use of anesthetics     . 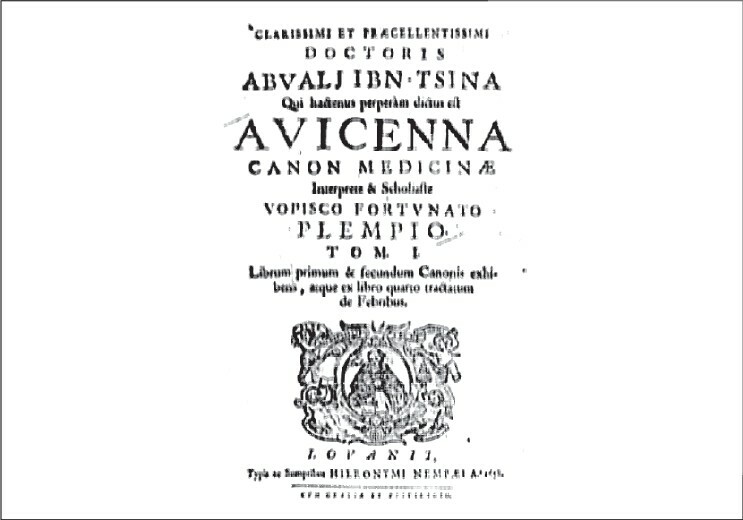 Figure 6: Another Latin edition of Ibn Sina's Canon of Medicine printed at Louvan in 1658. (Courtesy of the Koraes collection, Koraes Central Library of Chios). 1. Establishing departments for history of medicine in every university. each in his own specialty. This can be made as one of the promotion requirements, perhaps one paper for each promotion cycle. 3. Including history of medicine courses in undergraduate and postgraduate curricula of the colleges of medicine, pharmacy, and science. 4. Encouraging editing manuscripts in Master, PhD, and Postdoctoral studies. 5. Encouraging publications in history of medicine aimed for both the higher and the general education levels and for public information. Hopes are high; there is no shortage of resources and there is plenty to be done. Sincere efforts have already started in several parts of the Arab and Islamic countries. Sarton, G. The Study of the History of Science. Harvard: Harvard University Press, 1936, p. 5. Mukhtar AM. Rhazes contra Galenum. Bonn: Rheinischen Friedrich-Wihelms-Universitat, 1969, p. 6 (Arabic section). Pines S. "Razi critique de Galien". Actes du VIIe Congrès Internationale d'Histoire des Sciences (Jérusalem, 4-12 Aout 1953). Collection des travaux de l'Académie internationale d'histoire des sciences. Paris: Hermann, 1954, pp. 480-7. Glubb J. A short history of the Arab peoples. Hodder and Stoughton, 1969, pp. 289-90. Rehbock PF. "Globalizing the history of science". J. World History, Spring 2001, vol. 12: pp. 183-92. Ibn Al-Nadim, Al-Fihrist, Ramadan I (editor). Beirut: Dar El-Ma'rifa, 2nd ed., 1997. Ibn Juljul, Kitab tabbaqat Al-attibba' wa-'l-hukamaa, Fouad S. (editor). Cairo: French Bureau Publications, 1955. Sa'id Ibn Sa'id Al-Andalusi. Science in the Medieval World "Book of the categories of nations". In: Salem, SI and Kumar, A (Translators and Editors). Austin: University of Texas Press, "History of Science Series", No.5., 1996. Ibn Abi-Usaybi'a, Uyun 'l-anba fi-tabaqat aI-atiba'. (The sources of the knowledge of classes of doctors). Reda N. (editor). Beirut: Dar Maktabat al-Hayat, 1965. Cumston CG. "Islamic Medicine". In: Cumston CG, editor. An introduction to the history of medicine from the time of the pharaohs to the end of the XVIIIth century. London (UK): Kegan Paul, Trench, Trumbner/New York: Alfred A. Knopf, 1926, pp. 185-211. Dickinson EH. The medicine of the ancients. Liverpool (UK): Holden; 1875, pp. 37-9. Sarton G. Introduction to the History of Science. Carnejie Institution of Washington. Vol. 1 and Vol. 2, Part I. Baltimore: Williams and Wilkins Company; Reprinted: New York: Robert E. Krieger Publishing Co, Inc; 1975. Margotta R. The dark ages, the decline of Rome. In: An Illustrated History of Medicine. Lewis P, editor. Feltham, Middlesex: Paul Hamlyn, 1968, pp. 100-5. Al-Hassani ST. Thousand years of missing history. Manchester, UK: Foundation for Science Technology and Civilization (published on www.MuslimHeritage.com in January 2004). Gazanfar SM. The dialogue of civilizations: Medieval social thought, Latin-European Renaisssance and Islamic influences, Manchester, UK: Foundation for Science Technology and Civilization (published on www.MuslimHeritage.com in May 2004). Dawson C. "The origins of the Romantic tradition". The Criterion, vol. 11, 1932, pp. 222-248. Dawson C. The making of Europe: An introduction to the history of European unity. New York: Sheed and Ward, 1967. Dawson C. The formation of Christianity, New York: Sheed and Ward, 1967. Gilson E. Reason and revelation in the Middle Ages. New York: Charles Scribner's Sons, 1948. Gilson E. History of Christian philosophy in the Middle Ages. New York: Random House, 1955. Haskins Ch. The renaissance of the twelfth century. Cambridge, Mass./London: Harvard University Press, 1927 reprinted 1955. Haskins Ch. 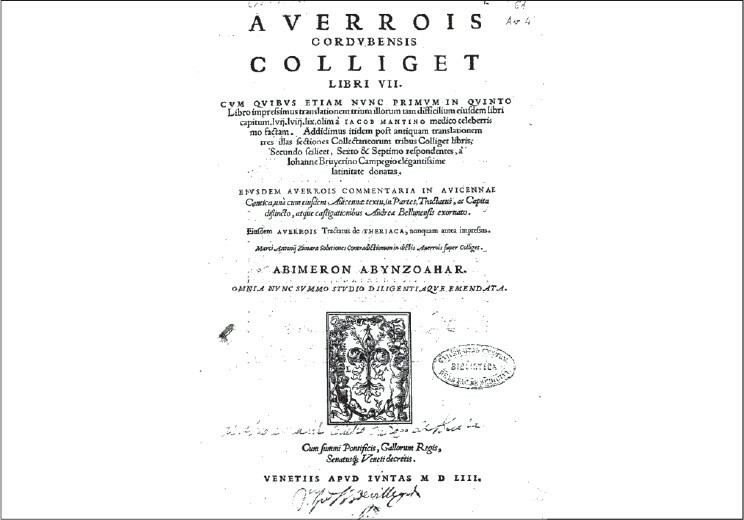 Studies in the history of medieval science. New York: Frederick Ungar Pub., 1967. Makdissi G. "Interaction between Islam and the West". Revues des études islamiques, vol. 44: 1974, pp. 287-309. Briffault R. The Making of Humanity. London: George Allen and Unwin, 1919, reprinted 1928. Ronan CA. Science: Its history and development among the world's cultures. Baltimore, Maryland: Williams and Wilkins, 1982. Campbell DC. Arabian medicine and its influence on the middle ages. Reprinted in Amsterdam (NL): Philo Press, 1974. Cumston CG. "Islamic medicine". In: Cumston CG (editor), An introduction to the history of medicine from the time of the pharaohs to the end of the XVIII century. London: Kegan Paul, Trench, Trumbner/New York: Alfred A. Knopf, 1926, p. 205. Senfelder L. History of medicine. The Catholic encyclopedia, 1914. Improvement by Catholic Answers' release of The Catholic Encyclopedia (TCE) of 1914 as the Original Catholic Encyclopedia (OCE) online: San Diego, Catholic Answers, retrieved 25 April 2009. Al-Razi (Rhazes), Kitab Al-hawi fi al-tibb (Rhazes Liber Continens). Hyderabad: Da'irat al-Ma'arif al-'Uthmaniya, 1961. Al-Razi, Kitab al-Mansuri. The Chester Beatty Library, Dublin, Manuscript No. 3997. Al-Rzai. Akhlaq al-tabib, Al-Abd AM (editor). Cairo: Maktabat Dar Al-Turath, 1977. Al-Razi. Ma al-fariq aw al furooq aw kalamun fi al-furuq bayn al-amradh. Qattaya Salman, editor. Aleppo: Institute for the History of Arabic Science, 1978. Ibn Al-Jazzar Al-Qairawani, Kitab siasat al-sibian wa-tadbiruhum. Al Hailah MA, editor. Tunisia: Al-Dar al-Tunisiyyah Li-'l-nashr, 1968. 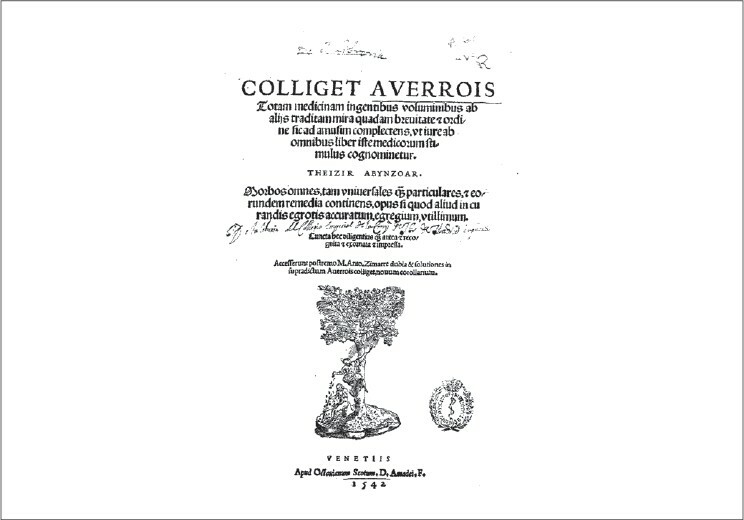 Al-Zahrawi, (Albucasis), in: Spink MS, Lewis IL, editors, Albucassis on surgery and instruments. A definitive edition of the Arabic text with English translation and commentary. London: Wellcome Institute of the History of Medicine, 1973. Al-Zahrawi. Kitab Al-Tasrif. Dublin: The Chester Beatty Library, manuscripts No. 4009 and 4932. Al-Zahrawi, Kitab Al-Tasrif Liman 'Ajaza 'an Al-Ta'alif. Manuscript no 502, Vol. 1-2. Bashir Agha Collection, Suleymania Library, Istanbul. Reproduced and commented upon by Fuat Sezgin. Frankfurt: Institute for the history of Arabic and Islamic Sciences, 1986. Al-Zahrawi KA. Al-Jiraha, Al-Maqala Al-Thalathun, Al-Tasrif Liman 'Ajaza 'an Al-Ta'ali. Al-Naser A, Altwaijri A, editors. Riyadh: Al-Farazdaq Press, 1993, 2nd ed. Ibn Sina. Kitab Al-Qanun Fi Al-Tib (The Canon of Medicine). Boulaq edition of the Canon, vol. 2. Cairo: Dar Sadir, 1977. Ibn Zuhr, Kitab Al-Taysir Fi Al-Mudawat Wa Al-Tadbir. Al-Khuri M, editors. Damascus: Dar al-Fikr Press, for the Arab Educational Scientific and Cultural Organization, 1983, 2 vols. Ibn Rushd, Al-Kulliyyat Fi Al-Tibb, Al-Jabiri MA, editor. Arabian Philosophy Heritage Series- Ibn Rushd Works No. 5. Beirut: The Institute for Arabic Unity Studies, 1999. Al-Baghdadi, Al Mukhtarat Fi Al-Tibb. Hyderabad: Osmania Oriental Publication Bureau, 1362-1364 H. (1941-1944), 4 vols. Ibn Al-Baytar. Al-Jamie Limufradat Al-Adwiya Wal-Aghdiya (Materia Medica). Vol. 2. Baghdad: Al-Muthana Bookshop; Undated. Ibn El-Quff, Al-Umdah Fi Al-Jiraha. Vol. 1. Hyderabad (IN): Osmania Oriental Publication Bureau; 1356 H.
 Ibn Al-Nafis, Al-Mujaz Fi Al-Tibb, Al-Ezbawy A, editor. Cairo: Islamic Heritage Revival Committee, Supreme Council for Islamic Affairs, Ministry of Endowments, 2004, 4th ed. Ibn Al-Nafis, Kitab Sharh tashrih al-Qanun, Qattaya S, editor. Cairo: The Supreme Council for Culture and the Egyptian Book Bureau, 1988. Ibn Al-Nafis, Risalat Al-A'dha', Ziedan Y, editor. Cairo: Al-Dar Al-Masriya-al Lubnaniya, 1991. Ibn Al-Nafis, Sharh Fusul Abuqrat, Ziedan Y, Abdel-Qadir M, editors. Cairo: Al-Dar Al-Masriya-al Lubnaniya, 1991. Ibn Al-Nafis, Al-Risalah Al-Kameliyyah fi Al-Sirah Al-Nabaweyyah, Omar AM, Hareedy AA, editors. 2nd ed. Cairo: Islamic Heritage Revival Committee, Supreme Council for Islamic Affairs, Ministry of Endowments, 1978. Friend J. Histoire de la médecine, depuis Galien jusqu'au commencement du seizième siècle, Pt. 3. Leiden (NL): Langerak, 1727, pp. 1-80. Radbill SX. "The first treatise on pediatrics". Am J Dis Child 1971;122:369-76. Garrison FH. An introduction to the history of medicine with medical chronology, suggestions for study and bibliographic data. 3rd ed. Revised and enlarged. Philadelphia and London: W B Saunders Company, 1924. Ullmann M. Islamic medicine. Islamic surveys No.11. Edinburgh (Scotland): Edinburgh University Press; 1978. Abdel-Halim RE, Jan MY. "Kinderheilkunde vor 1000 jahren, blick in die Arabish-Islamische Medizin". Der Kinderarzt 1983; 14:61-3. Abdel-Halim RE. "Pediatric urology 1000 years ago". Prog Pediatr Surg 1986; 20:256-64. Abdel-Halim RE. "Lithotripsy: A historical review. In: Endourology, Proceedings of the Third Congress of the International Society of Urologic Endoscopy. E. Matouschek editor. Baden-Baden: Verlag Werner Steinbruck, 1985, pp. 474-6. Abdel-Halim RE. "Urethral catheters: A historical review". Saudi Med J 1990; 11:87-8. Abdel-Halim RE, Altwaijiri AS, Elfaqih SR, Mitwalli AH. "Extraction of urinary bladder stone as described by Abul-Qasim Khalaf Ibn Abbas Alzahrawi (Albucasis) (325-404 H, 930-1013 AD): A translation of original text and a commentary". Saudi Med J 2003; 24:1283-91. Abdel-Halim RE, Abdel-Maguid TE. "The functional anatomy of the ureterovesical junction: A historical review". Saudi Med J 2003; 24:815-9. Abdel-Halim RE. "Re: Management of urinary tract infections: Historical perspective and current strategies: Part 1--before antibiotics". J Urol 2005;174:1502. Abdel-Halim RE. "Clinical methods and team work: 1000 years ago". Am J Surg 2006; 191:289-90. Abdel-Halim RE. "Contributions of Muhadhdhab Al-Deen Al-Baghdadi to the progress of medicine and urology. A study and translations from his book Al-Mukhtar". Saudi Med J 2006;27:1631-41. Abdel-Halim RE. "Contributions of Ibn Zuhr (Avenzoar) to the progress of surgery: A study and translations from his book Al-Taisir". Saudi Med J 2005;26:1333-9. Abdel-Halim RE. "Obesity: 1000 years ago". Lancet 2005;366:204. Abdel-Halim RE. "Contributions of Ibn Al-Nafis (1210-1288 AD) to the progress of medicine and urology: A study and translations from his medical works". Saudi Med J 2008;29:13-22. Al-Mazroa AA, Abdel-Halim RE. "Anaesthesia 1000 years ago-I. In: Atkinson RS, Boulton TB, editors, The History of Anaesthesia. London, New York: Royal Society of Medicine Services and the Parthenon Publishing Group, 1989, pp. 46-8. Al-Mazrooa AA, Abdel-Halim RE. "Anesthesia 1000 years ago-II". Middle East J Anesthesiol 2000;15:383-92. * Emeritus professor of urology. Formerly, professor of Urology at King Saud University College of Medicine and King Khalid University Hospital, Riyadh, Kingdom of Saudi Arabia.